Hibiscus Gin Fizz Recipe: filled with hibiscus-ginger flavor in every sip, this cocktail is made skinny using ErySweet by Steviva. 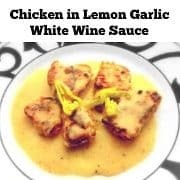 It’s a perfect drink for any time of the season and great for Keto, Paleo, low-carb diet. 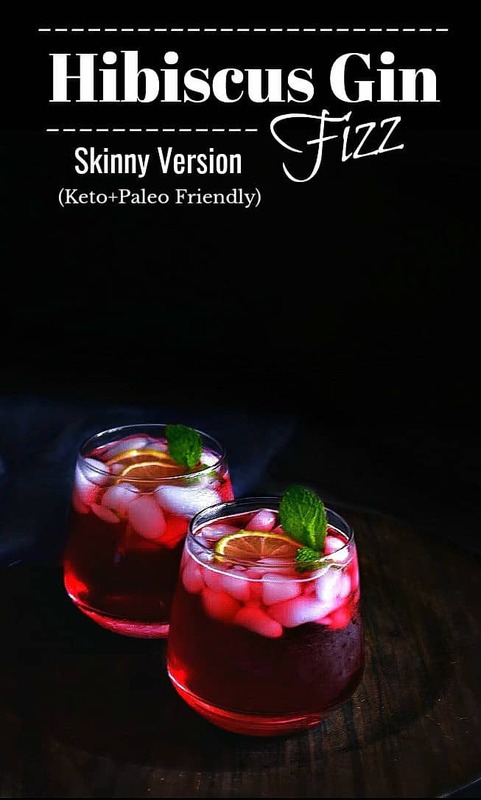 Hibiscus Gin Fizz Recipe is Perfect Keto Cocktails. Friday’s are meant to be celebrated and we are celebrating this one by making these Hibiscus Gin Fizz Recipe. 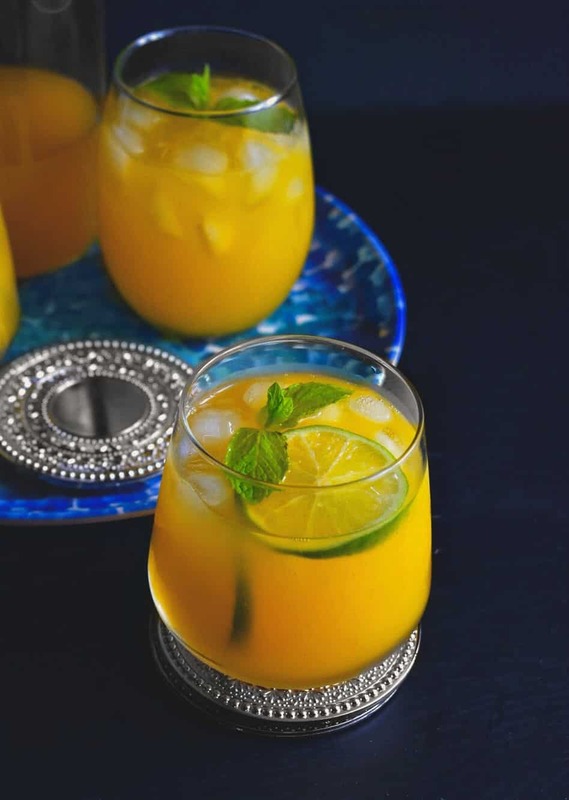 And another reason to rejoice is that this is a ‘Skinny’ (No-Carb) version of the recipe, that means you can gladly reach for that second glass without breaking any diet rules. ‘Cocktail’ rules our house celebrations, be it a gathering of 30-40 people or a date night with Mr.
More than any other drink or snack, the first question is always ‘What are we drinking Today’? But that also means that we literally consume most of the calories/carbs from these drinks which are a concoction of juices, sugar/sugar syrup or some flavored mix. 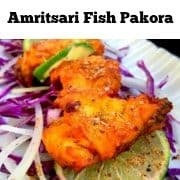 So even if you have not had any food, you’ve already consumed more than the needed calories by downing just 2-3 cocktails. To that, we add the current diet plans of many of my friends/family members, some are following Keto, Paleo, No-Carb, No-Sugar diet and some of them have diabetes or some kind of metabolic thing going on. That means, every party, we have someone not looking that happy as they can’t drink or eat their favorite dessert. 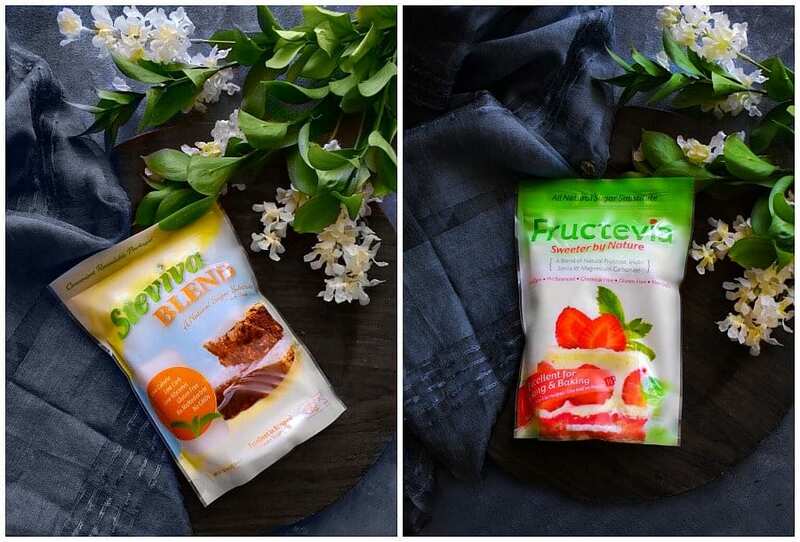 But soon, we got rid of that scenario as we discovered ‘Steviva’ – which offers a wide range of high-quality, clean-label (all natural) sweeteners and sweetening options for all of us. 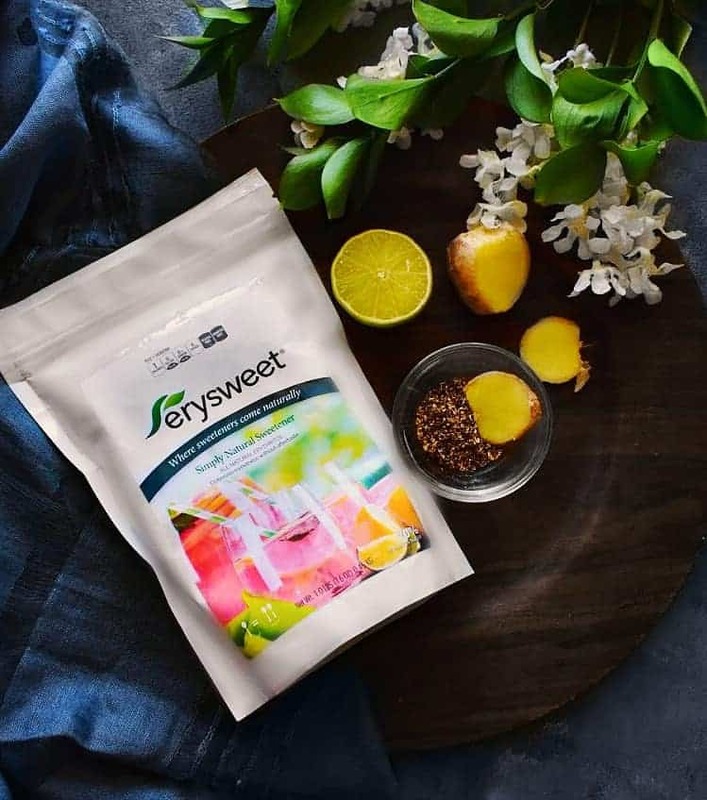 Whether you are following a certain diet or trying to lessen the sugar intake or simply looking for a healthier/all-natural alternative to sugar, they have a product for each one of us. 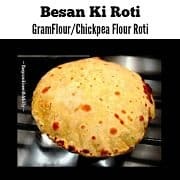 I was SUPER Excited to try them as we do eat a lot of desserts and we tried their sweetener in a couple of recipes (Indian or International) and it was a perfect match (to sugar). No-one guessed that the desserts were actually made using a sweetener as there was no ‘different taste’ or a ‘small’ to the recipes. 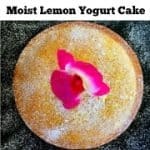 This was fantastic and I happily swapped the sugar syrup in my Hibiscus Gin Fizz Recipe with Erysweet. 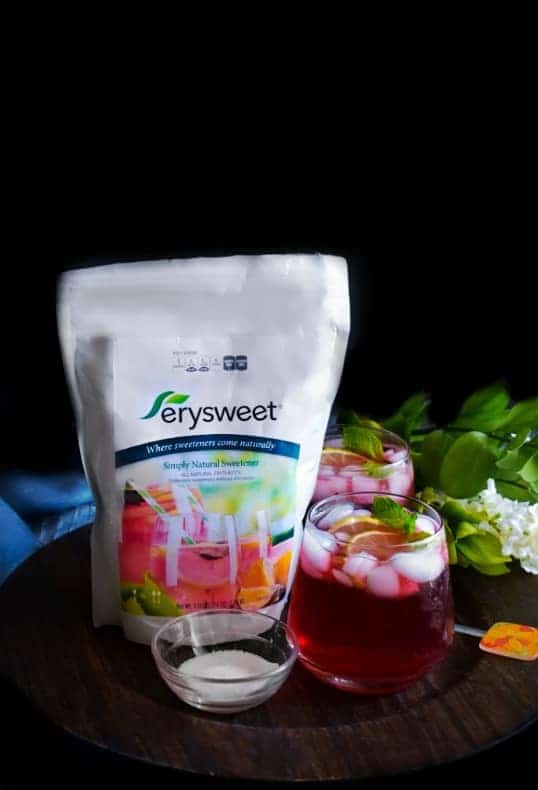 It’s a naturally derived erythritol and makes for a near 1:1 replacement for sugar in recipes. It tastes and looks exactly like fine granulated sugar but without all those carbs, calories or glycemic impact. So, I made the ‘Hibiscus Syrup’ for the drink using Erysweet as it’s perfectly safe to use for syrupy reductions. Now, as I mentioned above, this is an ‘All-Season’ cocktail and fairly simple, so I’m not using any actual Hibiscus flower as they are not so easily available everywhere. Instead, I’m using a Hibiscus tea which is made of all organic and natural ingredients (without any sugar/preservatives). I’ve added ‘ginger’ to the syrup as well because hibiscus with ginger takes the flavors n taste to just another amazing level. 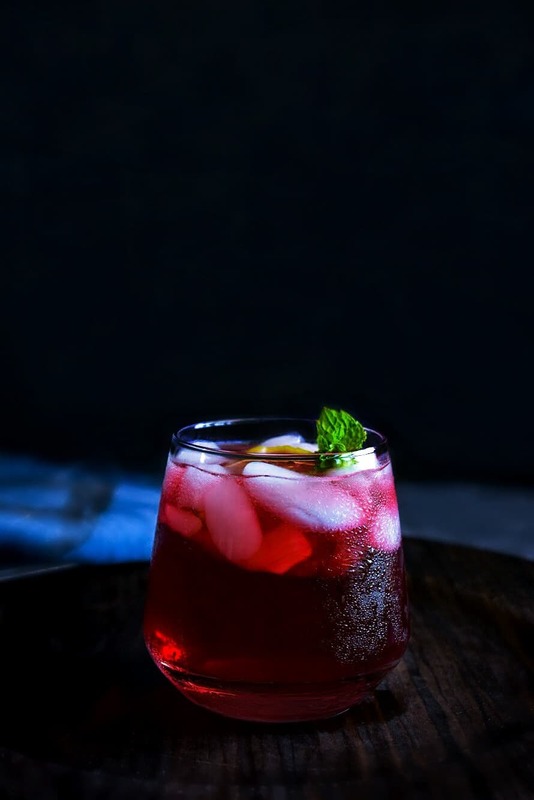 Once the hibiscus syrup is ready (takes 5 minutes), then it’s just a matter of a minute that you have the refreshing Hibiscus Gin Fizz Recipe in your hands. Simply, add the ice to the serving glass, pour the cold hibiscus syrup and add a ‘No-Carb & No-Sugar’ sparkling water to it. Now, a lot of ‘Gin Fizz’ would have egg white mixed in it, but this one is simple and I’m not adding any eggs. 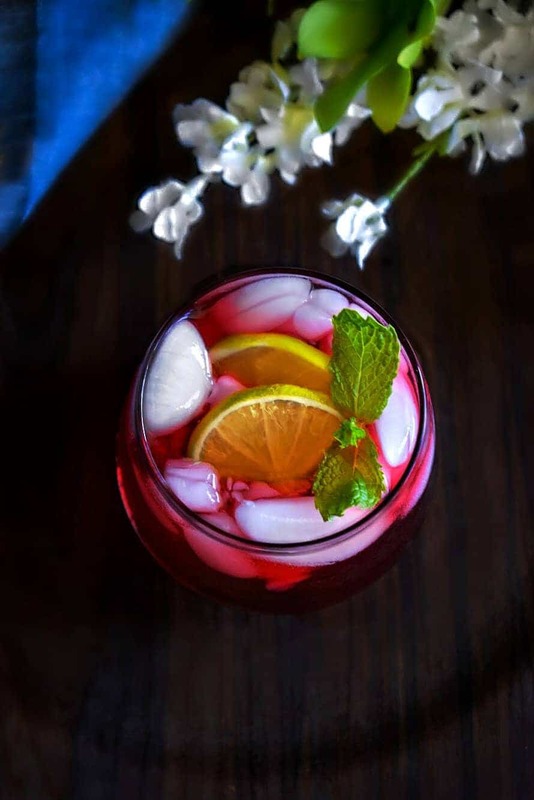 Simply garnish your gorgeous drink and sip along with loved ones. 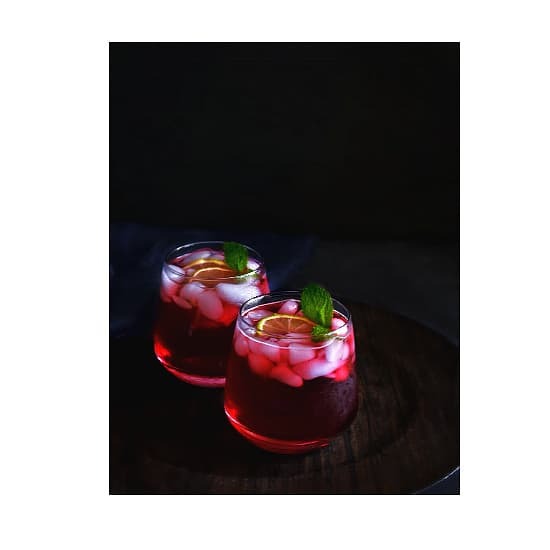 so, I HIGHLY recommend you give these ‘Steviva’ sweetener a try asap whether you’re making this Hibiscus Gin Fizz Recipe or simply baking a cake or even your favorite sweet breakfast. 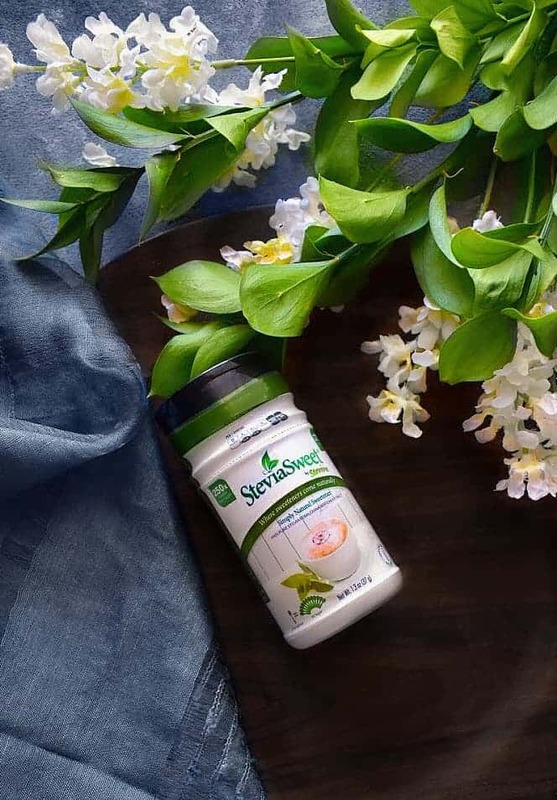 Don’t hold on to the deliciousness as now you can enjoy the same taste without adding any extra calories from sugar. 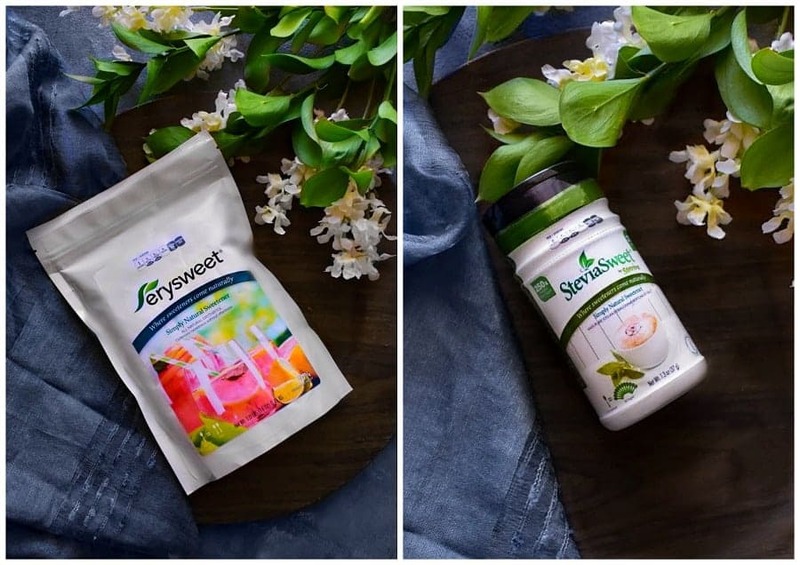 Also, I’m totally loving this “Stevia – Sweet” that I carry in my bag for everyday uses or even when I’m traveling. 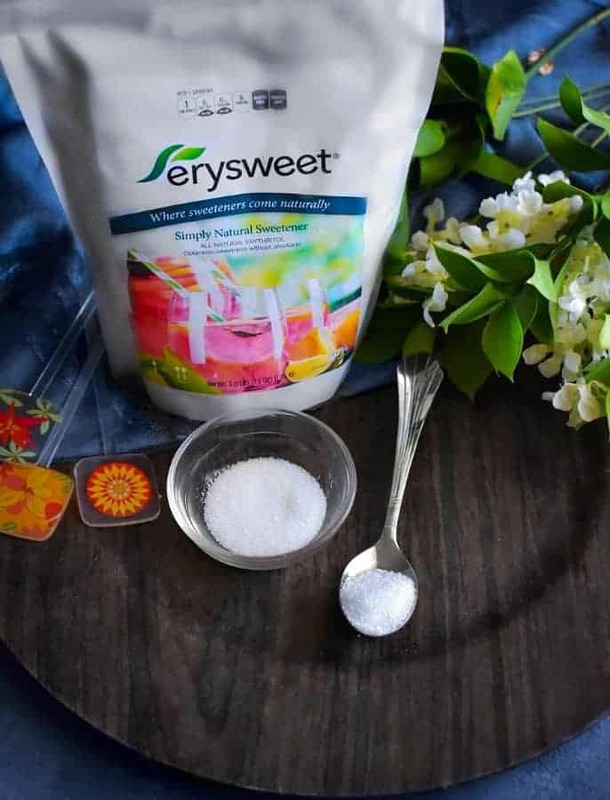 It is ‘100% pure, clean stevia extract in a fine powder & is 250-300 times sweeter than table sugar’. A little goes a very long way! 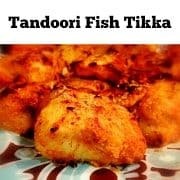 In a large pot add water along with ginger piece and bring to a boil. Now add hibiscus tea bags and steep for 3 minutes (turn off the heat). Add the Erysweet powder and stir everything. 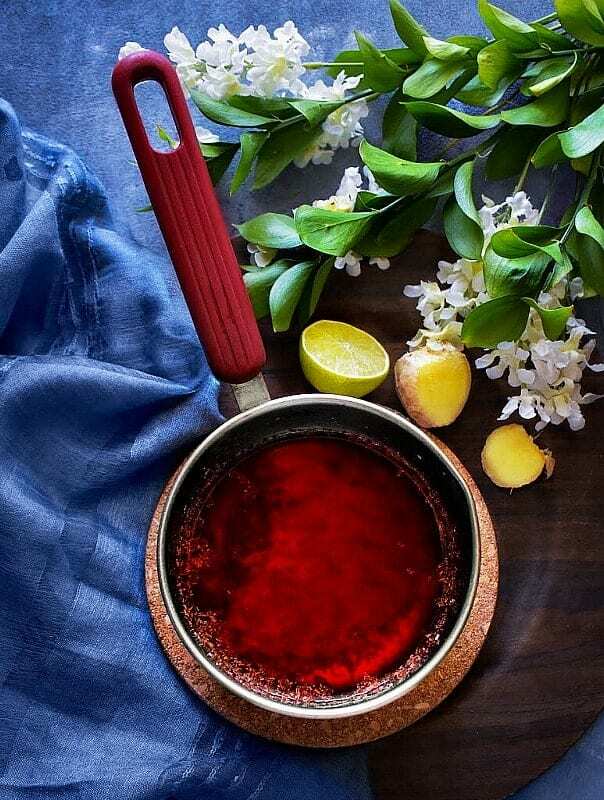 Using a sieve, strain the hibiscus syrup in a jar and let it cool completely. Take 6 Glasses and add ice till half way. 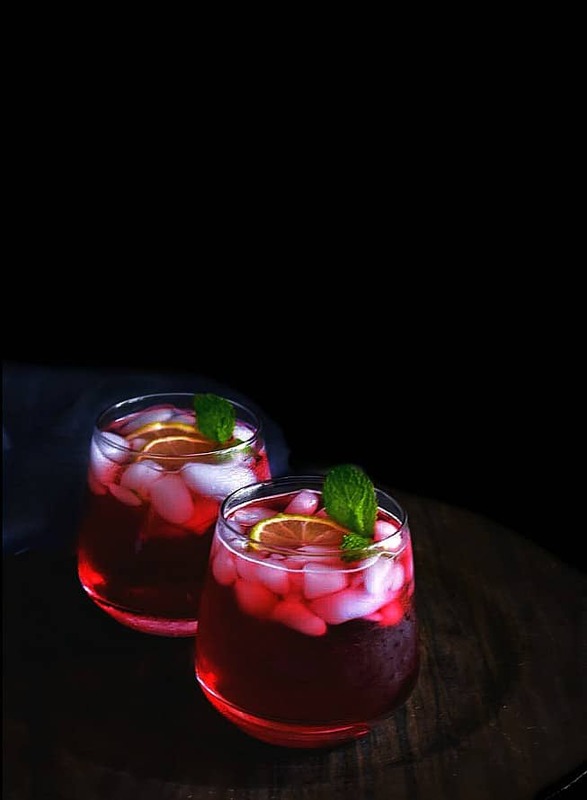 In a Drink Shaker, add gin, hibiscus syrup and few ice-cubes. Shake to mix everything and pour equally in 6 glasses. Top the glasses with La Croix and stir. 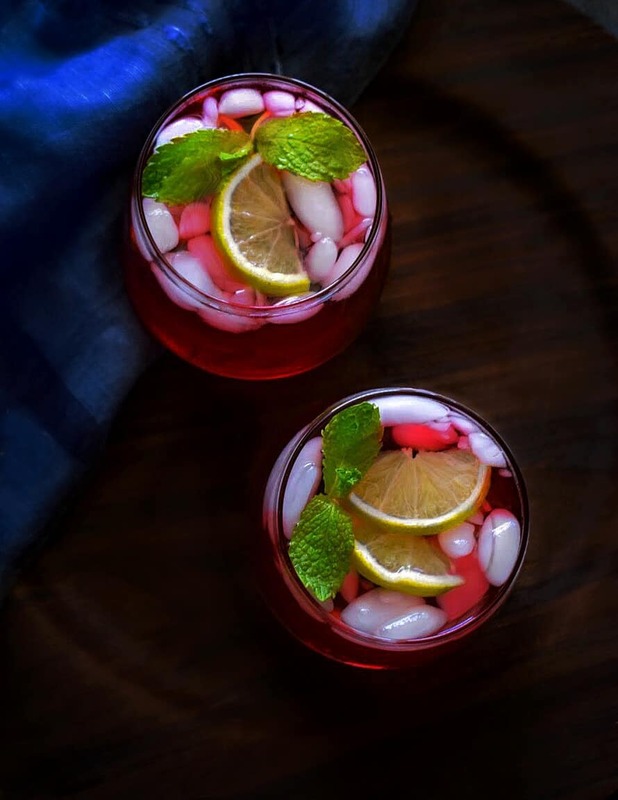 No Replies to "Hibiscus Gin Fizz Recipe (Using Stevivaa) #KetoRecipe"